About: Ainsworth Homeopathic Pharmacy is a dispensing chemist that offers traditional and homeopathic remedies for humans and animals as well as an advice service. Overseas orders are welcome. how do you get an appointment without holding on the phone for 10/15 minutes ,listening to the same message over and over again?! if its soooo difficult to get through would it not make sense to get appointments online??? Shortly out of hospital. The lady I spoke to was so helpful and supportive. She diagnosed me, medicine arrived next day and within 24 hours I was feeling considerably better. Marvellous. I went to pick up medicine for someone and due to my smartphone not giving me direction with each street name I had to call the clinic 3 times. On the first occasion the lady was very kind and told me to call them back when I come out of Bond Street Station. Once I xame out I called again and someone called Chris answered the phone. He was most unhelpful, ill mannered and impatient customer advisor I have ever come across. He was not willing to help me when I seeked direction. I said where I was standing and he very harshly said why I can't use my smartphone for it. I asked him if I should take a left turn and he hanged up on me. When I got there I found everyone else to be nice and polite. Such a nice place it's a shame that he would treat a customer like this. I tlod about the incedent to the counter lady she took note of it. Let's hope he can learn better customer service. Otherwise it looks such a nice and serene establishment. A wonderful place .the staff are so helpful and give such good advice .I really can t recommend it highly enough . No need to hesitate . 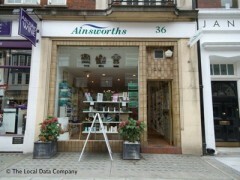 I have used Ainsworth since my daughter was born 31 years ago. Their advice was always brilliant and knowledge second to none. It has worked well in our family and the service was brilliant. When not able to collect the remedies arrived the following morning in the post. I could not recommand them more.